Continuity mistake: Ethel's full name in this episode is Ethel Mae Potter; however in a earlier episode, Fred calls her Ethel Louise, and in another episode she is called Ethel Roberta. Visible crew/equipment: When Ricky and Lucy are dancing in the living room, the camera swings too far to the left, and the edge of the set wall and the adjoining bedroom set can be seen briefly. Deliberate mistake: In this episode Lucy is trying to get Ricky to notice that their anniversary is on Monday the 19th by showing him a large calendar with the 19th circled. However, when they are in California and they celebrate their anniversary and Ricky asks for information to be wired to him, the telegram tells him that their anniversary is on the seventh. Trivia: Fred and Ethel's bickering relationship didn't require much acting; in real life Vivian Vance and William Frawley didn't care for each other at all. Trivia: It was the first to tape before a live audience. Trivia: Lucy, Ricky, Ethel, and Fred all do the impressions of Maurice Chevalier. Thirty-six years later, the same impression is done in the 11th episode of The Simpsons. Ricky Ricardo: Fred, how often is Ethel's checking account overdrawn? Ricky Ricardo: Never? How do you manage that? Ethel Mertz: It's easy. I never had enough money at one time to open a checking account. Fred Mertz: She spends money like I'm printing it in the basement. 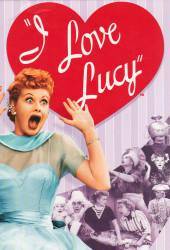 Lucy Ricardo: This whole thing is Ricky's fault. Lucy Ricardo: Yeah, if you hadn't have left Cuba to come to America, we wouldn't have gotten married and we never would've come to Switzerland in the first place. Question: I know this show is from the time period when a lot of couples had two beds in their room. Just out of curiosity, when did it become acceptable to show a couple's bedroom with a single bed on TV? Chosen answer: According to Snopes.com, there is no definitive answer, but the mid-1960s is the most verifiable date with "The Munsters" being cited as the first, although others claim "The Brady Bunch" showed the first couple seen in a double bed. An early TV show from the late 1940s titled, "Mary Kay and Johnny" is also thought to have shown the married couple's bedroom as having a double bed, although probably not with them in it. However, this was when TV was aired live, and there are no surviving episodes, only anecdotal accounts. Question: Lucy buys a 3 piece sofa set. One piece is an armless sofa chair. It is seen in the next episode but is never seen again. Where did it go? Chosen answer: It's not known. She may have moved it to the spare room or it may be in a corner just off camera. There could be any number of reasons, though it probably took up too much room on the studio set, and it was removed, making it easier for the actors to move around.